Source: Diabetes Superfoods Cookbook and Meal Planner . This elegant puffed pancake can be a decadent breakfast or a light dessert to satisfy a sweet tooth. Try different fruit and yogurt combinations to add variety. Preheat oven to 400 degree F. Lightly coat two 8-oz ramekins (4-inch diameter) with cooking spray. Set aside. In a medium bowl, whisk together the egg substitute, flour, milk, oil, vanilla, and salt until smooth. Pour half the batter into each ramekin. Set the filled ramekins on a baking sheet. Bake for 20 to 25 minutes, or until golden brown and puffy. Remove from the oven. Using the tip of a knife, gently pierce each pancake in one place. Allow to stand for 5 minutes so you don't burn your fingers when handling the ramekins. Meanwhile, in a small bowl, gently stir together the raspberries and strawberries. 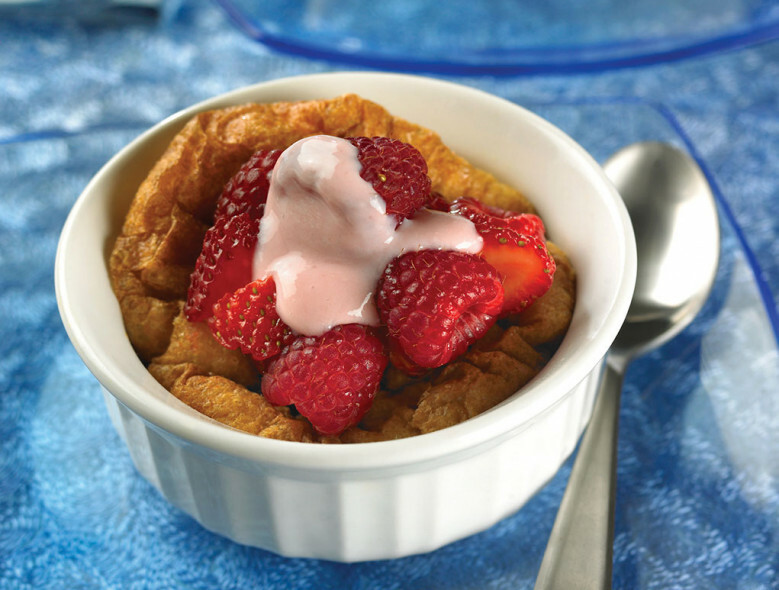 Spoon half of the berries over each cooled pancake, then dollop each with 1 tablespoon yogurt.